The Irish consultancy market has continued to grow over the past 12 months, albeit at a slightly slower rate (less than 5%) than last year. This is perhaps unsurprisingly given the bumper growth (11%) of 2016. 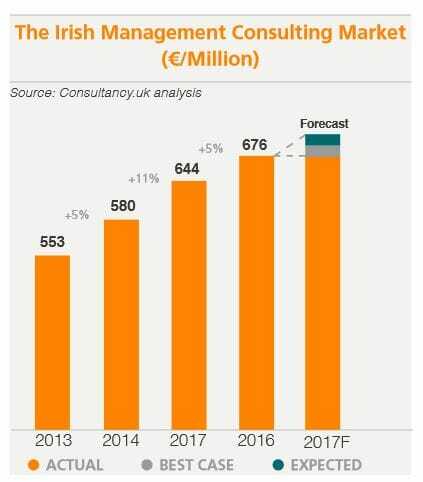 Nonetheless, Ireland’s consulting industry has still managed to outpace the UK over the past two years. The sector continues to offer strong employment prospects for both graduates and experienced hires alike. In 2017, the consulting sector has maintained solid growth across all core service lines of Strategy, Operations, Technology, Finance and HR. Increasing levels of Foreign Direct and Inward Investment has led to a plethora of advisory opportunities and business driven by a buoyant M&A market. From an industry perspective, the biggest buyers of consulting services have been Financial Services, Consumer, Industrial and the Public Sector. Over the last 12 months, the foundations of the new service lines have been solidly laid and seem set to be areas of real growth as we move forward into 2018. Digital transformation and customer advisory has been the hot topic over the last few years. This market was given little coverage by the large consultancies until recently, but there has been a concerted effort to bolster capabilities through both recruitment and acquisition given the huge client demand and the fact that this area offers the opportunity for advisory firms to demonstrate their breadth of offerings (strategy, operations, technology and cultural change). Moving forward, consultancies will continue to break into new markets by offering an ever-increasing suite of services and products in line with client demands. This will involve diversifying their portfolios away from broad-brush business and technology transformation advisory into topics, such as Artificial Intelligence, Robotics, IoT and FinTech. Consultancies will also creep into productised offerings, as well as providing advisory services around these topics. Despite public scrutiny, the public sector has remained the biggest buyer of consultancy services in Ireland (25%) over the past year and seems set to remain so as Ireland continues its economic upturn whilst dealing with the omnipresent spectre of Brexit. Ultimately, the implications of Brexit are yet to be seen on the consulting market here in Ireland. It seems set to bring the inevitable mixture of challenges and opportunities. 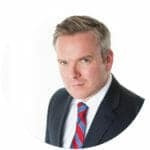 Firms entering the Irish market or spinning out their Irish entities as a result of Brexit will inevitably look for support from management consultancies. A recent study of the Irish consulting sector suggested that 89% of revenues are sourced from clients on Irish soil, suggesting that exposure to an immediate loss of revenue is limited. Financial Services (21%) have continued to be another leading acquirer of services and there appears to be opportunities for Ireland to continue to vie with Germany and France when it comes to attracting firms that are relocating out of the UK. The human capital cost of Brexit could lead to further growth of the consulting market in Ireland. Global brands who have been trying to break down the Chinese walls created by the federated partnership model may now find it increasingly difficulties to move their own talent across borders to service their clients’ needs. Similarly, small and mid-sized consultancies that deploy staff to Dublin on a project-by-project basis from London or Paris could look to establish permanent operations here in the country. Overall, the remainder of 2018 looks set to be an exciting time for the consulting sector as a whole, with growth now looking likely across the board. Professionals who can blend a skill set that combines business and technology will continue to be the most in demand, as will those capable of spearheading drives into new services that are outside the core proposition base of consulting. Our Consulting & Advisory recruitment team are consistently ready and prepared to assist with hiring requirements for small and large projects. To view up to date salary trends for 2018 please see full survey comparison by sector here. For further information please contact Owen Thomas +353 1 661 0444 or email othomas@lincoln.ie.